The Los Angeles Marathon had its 31st anniversary on Sunday. For some, the day marked the first time they ran a full marathon, while others celebrated their commitment to the tradition by running the 26-mile race for the 31st time. 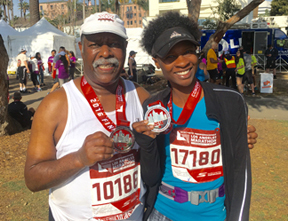 This was the case for first-time LA Marathon runner Latasha Lyons and her running mentor Van Hutchins. Lyons is founder of FunFIT, a healthy living brand that promotes the importance of fitness. Hutchins is a legacy runner, a participant that has ran every LA Marathon since its inception in 1985. Two years after he returned from service in Vietnam, he began running for exercise around the track at Dorsey High School. Hutchins then participated in long distance races, including a 10-kilometer race at UCLA, before running the LA Marathon. In the early years, the route of the marathon would start from the intersection of Adams Boulevard and Figueroa Street. The route would lead runners through downtown LA, to Sunset Boulevard and through the Crenshaw Blvd and Pico boulevard intersection, noted Hutchins. The route has since changed; taking runners from Dodger Stadium to Silver Lake through Hollywood and Beverly Hills. Lyons, an Illinois native, enjoyed the support she received while running. Hills were a challenge for her, especially the hill near the Disney Concert Hall. “They had drummers there, I felt like I was in a movie, just hearing all those drums and tackling that hill,” said Lyons. “Hills [are] my hard thing, but when I was training, I made sure that I trained uphill so that I could get used to running uphill. Lyons would call Hutchins for advice on training. Lyons, a former sprinter, had to learn the strategies of marathon running. She trained for four months, adding a mile to her running regiment every week until she reached 20 miles. Hutchins emphasized the importance of running with patience and doing activities that push people outside of their comfort zone. Mile 20 is a tough spot for runners, both Hutchins and Lyons noted. At this vantage point, Lyons switched her music playlist from old-school hip-hop to the inspirational tunes of Tasha Cobbs in order to motivate herself. Both Hutchins and Lyons finished the marathon, Hutchins representing an elite group. Hutchins was one of 157 legacy runners. The LA Marathon was a “bucket list” item for Lyons. Although she does not want to run in the Marathon again, wants to continue supporting the event in the future.